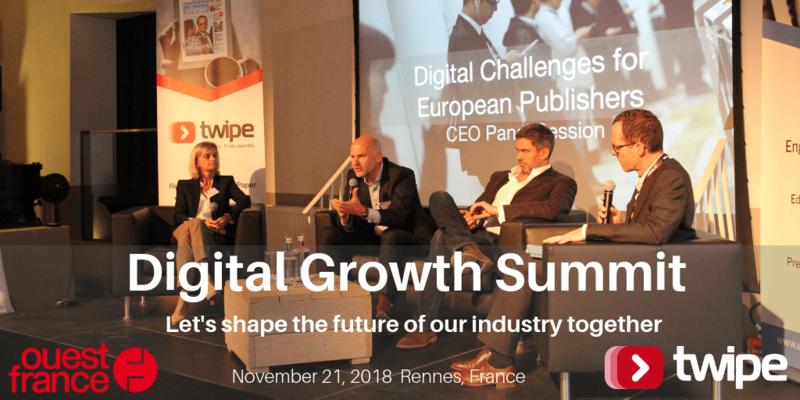 Join us for the second edition of our invitation-only Digital Growth Summit on November 21st in Rennes, France. We will bring thought-provoking speakers, organize a CEO panel and celebrate 5 years of L’édition du Soir with Ouest-France. Meet with business leaders from all over Europe to find common solutions to the economic and technological factors that are shaping and disrupting our industry. Contribute and learn in the casual environment of “Le Couvent des Jacobins”, a recently renovated monastery in Rennes, the capital of Bretagne. The central theme of this 2nd edition is “Creating a Shared Future in a Disrupted World“. The business and technological challenges faced by newspaper publishers are huge. The human, financial and technological resources required to thrive in the future, go beyond individual publishers’ capabilities. Collaboration, co-investment and even co-opetition are inevitable. The full list of speakers to be announced soon. See the highlights from the first Digital Growth Summit. On the night before the Summit we organise a visit to the newsroom and printing facility of Ouest-France at peak time. We will end the Summit at 18h30 with drinks and dinner, then we will celebrate together the 5th anniversary of L’édition du Soir in an unforgettable party. We will hold a roadmap session for Twipe customers in the morning of Thursday November 22. Let’s shape the future of our industry together. Looking forward to your participation in Rennes! Please confirm your attendance for the summit and newsroom visit. The event takes place at the historic Le Couvent des Jacobins in Rennes, the highly dynamic capital of Bretagne. The first stone for this former church was laid in 1369, and since then it has served as a crossroads dedicated to meeting and exchange. How should I travel to Rennes? Rennes is reachable from Paris by high-speed train in 90 minutes. Its airport also offers direct flights from many European cities, including London, Amsterdam, and Dublin. We recommend to stay at the Mercure Rennes Centre Parlement, the former printing facility of Ouest-France. We still have a few rooms left at a promotional rate, contact us for more details.